A series of clear days mean that we’ve had some stunning sunsets over the past few evenings, coupled with a very bright waxing moon. We have quite a dense plantation of pines to the west of the house, so our view of the setting sun is limited to glimpses down the road and through the trees. The skies have been looking so pretty that I decided to make the effort to walk up the hill from the house with the camera and tripod to get some photographs. There are a couple of clearings where you can get a clear view right over to the Cézallier and the mountains of Cantal beyond. I’m really glad that I did! The sky was just beautiful, shading from golden-orange through pink to a dusky violet as the sun went down and evening came on. 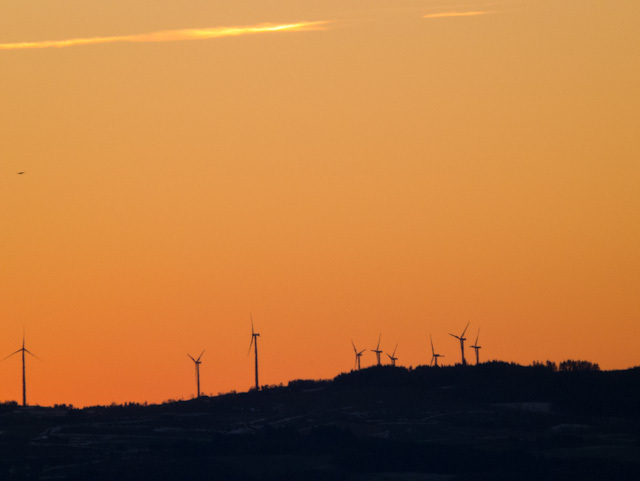 Here you can see the wind turbines at Ally in the Cézallier, standing out clearly against an orange sky. 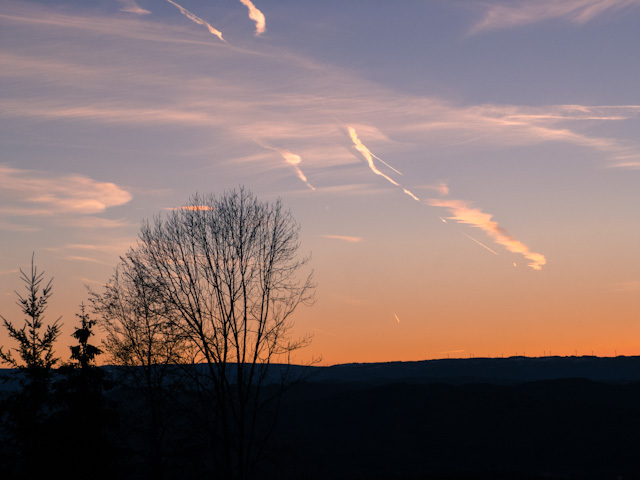 The vapour trails from aeroplanes become part of the skyscape. 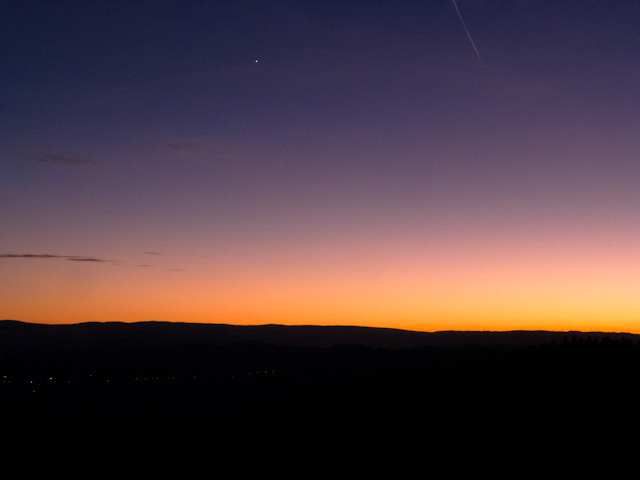 You can just see Venus at the top of the picture as the sky finally darkens. I had another go at getting some shots of my old adversary the moon. These are the ones that I’m most pleased with. 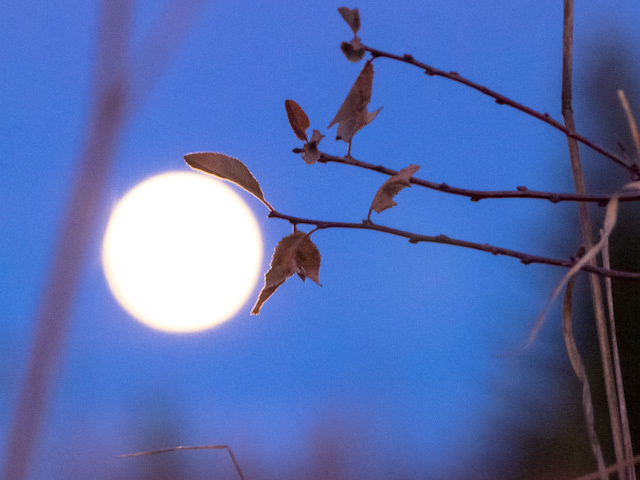 The moon itself is still a bit blurry, but I don’t mind that, as the twigs in the foreground are sharp. I think they look a little like Japanese prints. 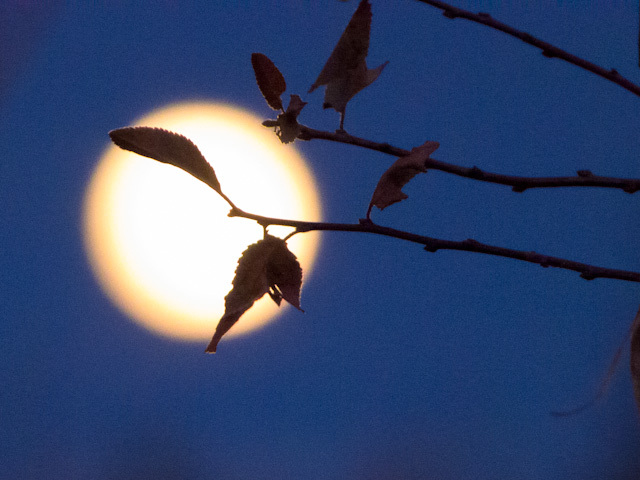 That last on looks like a pearl held in a setting of copper leaves – or is that just me? Anyway, it was a great (if chilly) experience, and I stayed out much longer than I meant to. 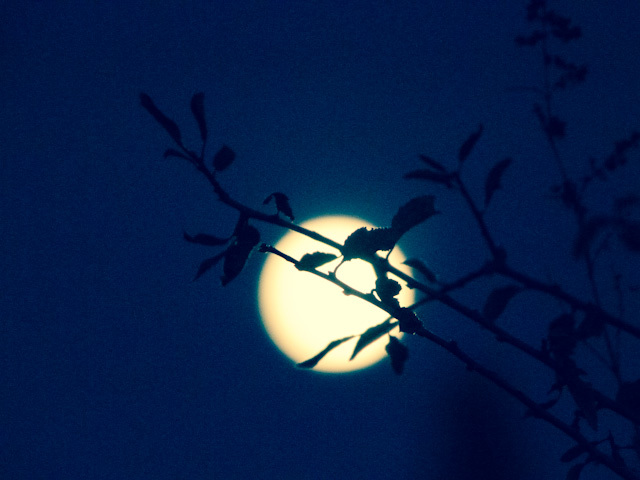 It was lucky the moon was so bright, as I hadn’t taken a torch out with me, but I got back home OK by its light. great image-love the solitary bird on left! make sure you put your thermals on next time! Thanks! I’d like to claim it was all planned, but I didn’t notice the bird until I looked back at the photo later.